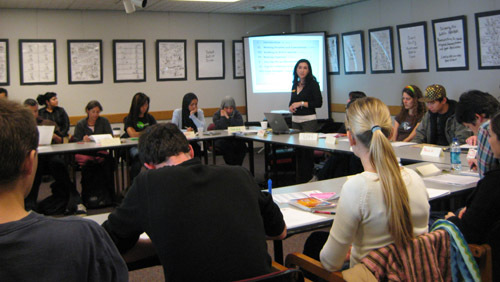 iLead is a drop-in workshop program for UC San Diego students. iLead provides students the flexibility to choose workshop sessions on various communication and leadership topics that align with your individual interests and schedule. Receive a stamp for each session you attend; 6 stamps earn you a certificate of completion and 10 stamps earn you validation on your Co-Curricular Record! Attend an iLead orientation during week 2 and collect your first stamp on your "iLead Stamp Card." Note: You only need to attend one iLead orientation during any quarter throughout the academic year. Your participation in iLead Orientation is highly recommended as it will greatly enhance your expereince in the program. Attend iLead workshops and collect stamps. Collect 10 stamps to spell LEADERSHIP and submit a one-page written reflection to receive a certificate of complations and validation on your Co-Curricular Record. If you have collected 6 stamps, email a picture of your completed stamp card to ccl@ucsd.edu. In the context of iLead's Learning Outcomes, how has your participation in iLead contributed to your own understanding of your talents, values, and interests as they relate to leadership? How will you continue to develop and apply your communication and leadership skills to facilitate positive social change at UC San Diego or in the community? Reflection must be double spaced, 12 pt font, with 1 inch margins: Times New Roman or Arial font. Once your completion materials have been reviewed and your workshop attendance has been verified, a Program Coordinator will notify you of your completion of the program. At this time you will receive an electronic certificate of completion (and if you collected all 10 stamps, validation on your Co-Curricular Record). 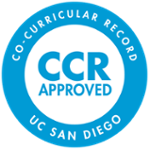 Your Co-Curricular Record (CCR) will be updated upon completion of the program. You can use your CCR to help demonstrate to employers, graduate/professional programs, and for awards the competencies and skills you gained through your experience.